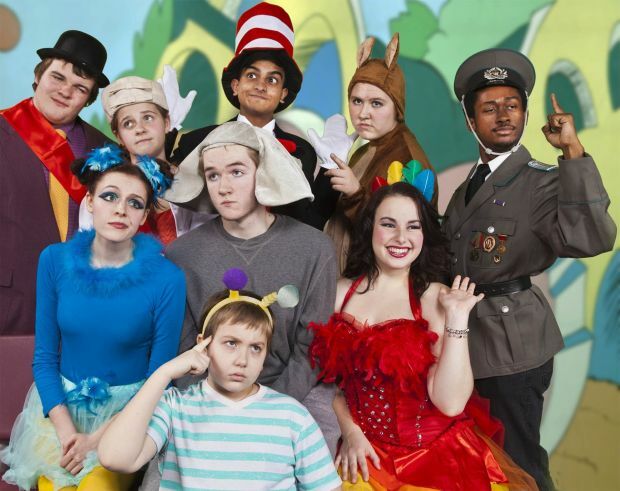 The Munster High School cast of the musical "Seussical" includes, front row, Jojo (Noel Fary), middle row, Gertrude (Morgan Papesh), Horton (Steven Caraher), Mayzie (Colleen Kifer), and back row, the Mayor (Daniel Straka), Mrs. Mayor (Alex Raycroft), Cat in the Hat (Rohan Chatterjee), Sour Kangaroo (Rachel Jamrose) and General Schmitz (Calvin Sanders). Sour Kangaroo (Rachel Jamrose) and Horton (Steven Caraher) ponder their future in a scene from the Munster High School production of "Seussical," opening Thursday at 7 p.m.
MUNSTER | The Munster Theatre Company of Munster High School will present the fanciful "Seussical" as its fall musical production, opening Thursday at 7 p.m. Inspired by Dr. Seuss stories and characters, "Seussical," with book, music and lyrics by Stephen Flaherty and Lynn Aherns, will be performed at 7 p.m. Thursday, Friday and Saturday, and at 2 p.m. Sunday in the Munster High School Auditorium, 8808 Columbia Ave.
Tickets are $7 at the door for adults, and $5 for senior citizens and students. Tickets are available at the Auditorium Box Office on performance nights or in advance by calling (219) 838-2235 or emailing apkinser@munaud.org. "Seussical" is a musical that blends several stories from Dr. Seuss's most famous books and presents them in a mostly sung-through format. "The Cat in the Hat" (Rohan Chatterjee) narrates the story of Horton, an Elephant (Steven Caraher), who discovers a speck of dust containing Whos, including Jojo, a Who child sent off to General Gengus Khan Schmitz (Calvin Sanders) military school for thinking too many "thinks" by his parents, Mr. Mayor (Daniel Straka) and Mrs. Mayor (Alex Raycroft). The Grinch (Billy McDunn) also populates the tiny world of the Whos. 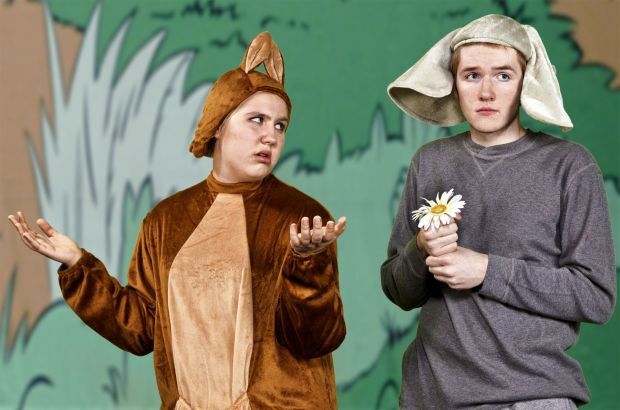 Horton faces a double challenge - not only must he protect the Whos from a world of naysayers like the Sour Kangaroo (Rachel Jamrose), and dangers, but he must guard an abandoned egg left to his care by the irresponsible Mayzie La Bird (Colleen Kifer). Although Horton faces ridicule, danger, kidnapping, and a trial presided over by Yertle the Turtle (Thomas Speranza), the intrepid Gertrude McFuzz (Morgan Papesh) never loses faith in him. Ultimately, the powers of friendship, loyalty, family, and community are challenged and emerge triumphant. The artistic staff includes Producer/Director Larry A. Brechner, Producer/Director/Choreographer Carol Lynn Brechner, Music/Orchestra Pit Director William Woods and Student Choreographer Laurel Demkovich.